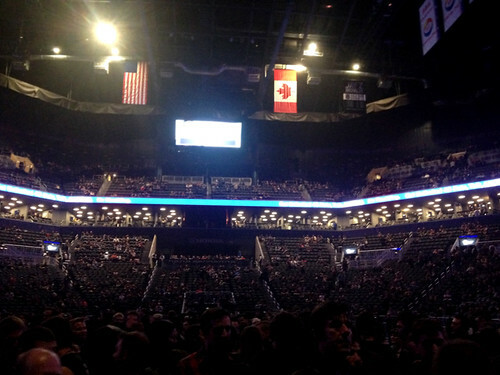 Who else went to the Nine Inch Nails show at Barclays Center two days ago? I was there, and it was spectacular! 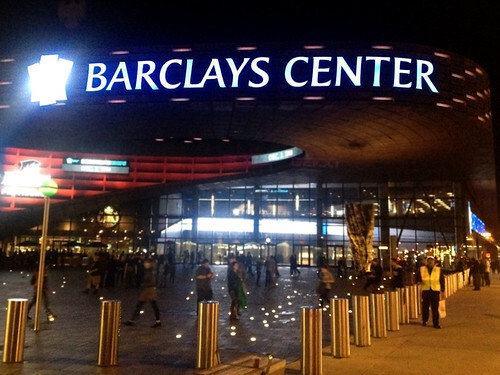 It was my first time at Barclays Center – I generally dislike arena/stadium venues as a rule, but I had GA Standing tickets for this show so I figured it couldn’t be too bad. …and then, believe it or not, I found one! I had to eat it pretty quickly to get back to the floor before the opening band (Godspeed You! Black Emperor, how awesome!). 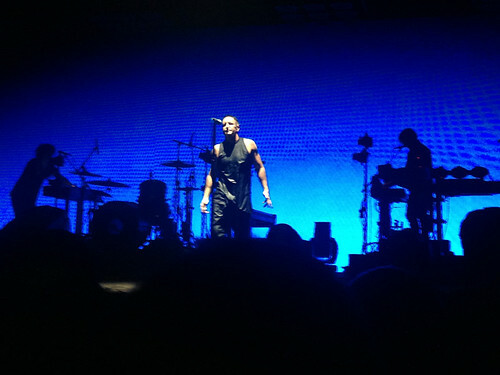 But I had come to the show straight from work, so I was starving anyway. I asked the staff if the burger was vegan – the cook herself came out and assured me that the patty was vegan, but they could not be sure about the bun. That’s par for the course, it seems. 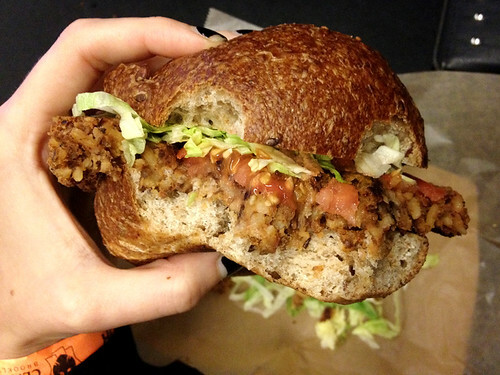 The bun was whole wheat, but too thick and dense. If you want to be able to take a proper bite out of a burger, the bun needs to be light and soft enough to compress a bit when you sink your teeth into it so you can get both bun and patty in the same bite! I ended up eating my burger in pieces, discarding most of the bun. The menu said the burger comes with barbecue sauce and cheese – so I asked for mine without the cheese, but I think they mistakenly assumed that meant I did not want barbecue sauce either. So I was sad to miss out on that, but didn’t want to take the time to complain and get the order corrected. I think the sauce would have added a nice balance to the other components of the burger, although the lettuce was quite crisp and the tomato slice exceptionally fresh and juicy! 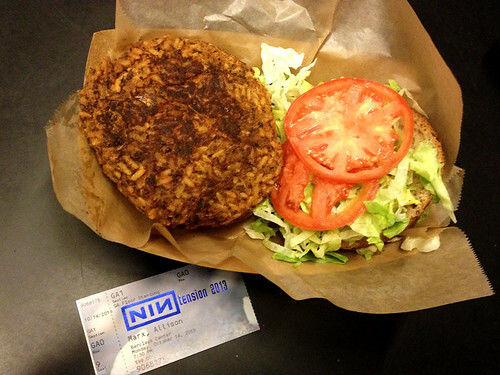 And the patty itself was great – way better than you would expect a veggie burger from a stadium venue to be! Mostly consisting of rice and black beans, it had a surprisingly spicy kick to it. 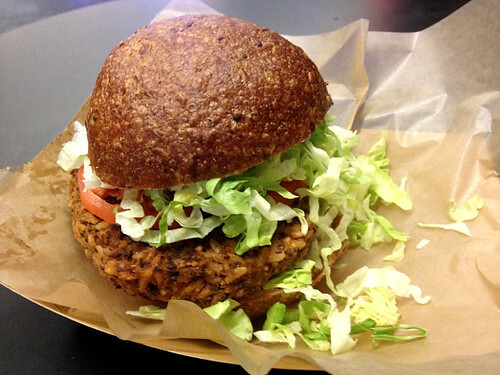 And it was not too dense or compact like many veggie burgers – I wonder if it was made on site, and not delivered frozen? It seems possible. Or at least, it could have been locally made in Brooklyn! It fell apart a bit as I was eating it, which made for a slightly messy meal (grab a fork!) but it was yummy. 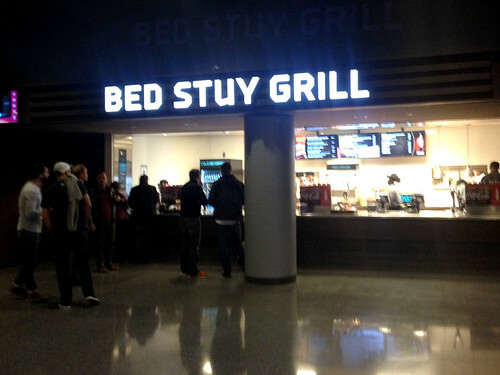 Not a bad start to the evening… and good to know that there are vegetarian options at Barclays Center! And there are probably even more that I didn’t have time to explore – I didn’t even check out the food vendors on the upper levels! 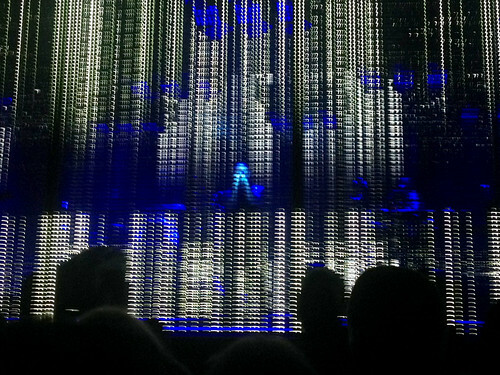 And, like I said, NIN was amazing.